A show of Bulgarian folk tales produced by Ambassador Theater with Bulgarian and American artists. 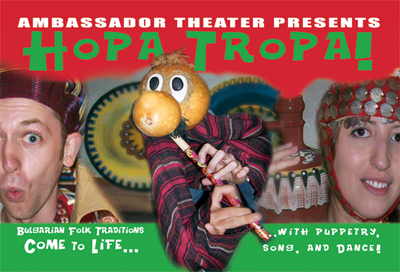 A fun, educational and interactive show for the whole family based on amusing folk traditions from Bulgaria! Colorful stories told through dance, songs, sounds and imaginative found objects used as puppets will make a fun time for everyone. The story is based on famous Bulgarian folk tales, jokes, and songs, written by renowned Bulgarian director, Lilia Slavova, set design by Antonio Petrov, puppets designed by Julia Tasheva, choreography by Ivan Dimitriov, and music arranged by Petko Kolev. For adults and children. Cast & Crew of Hopa Tropa!